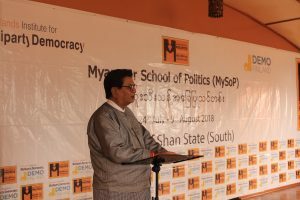 The Myanmar School of Politics (MySoP) is proud to announce the completion of its 12th intensive political training course in Shan State (South), Myanmar. With the training held for the second time in Shan State, 28 state level senior politicians from 14 political parties, along with one official from Election Sub Commission, graduated from MySoP. During the ceremony, Wouter Jurgens, Ambassador of the Netherlands to Myanmar; Tin Oo, Advocate General of Shan State; and Mr. Htin Kyaw, Chair of Election Sub-Commission (Shan State) gave speeches. Working across party lines, the graduates studied topics such as political theory, gender in politics, election rules and regulations, party programme planning, how to operate as a state level politicians. The participants also carried out a country comparison with Indonesia. Trainers from Myanmar, the Netherlands and Indonesia conducted the 17-day course from 24 July to 9 August 2018 in Nyaung Shwe township, Shan State, Myanmar. To find out more about our work in Myanmar, click here or contact us via info@nimd.org.